Hello~~~ It's been 9 months since i have my braces on! Just a quick update: The gaps are clearly closing up. The back teeth are going forward. During the first 2 months, there weren't any obvious change. The change was observed after 4 months. I measure the gap every time after i went for treatment. I'm glad that my teeth are moving quite fast! Also, i did not have any ulcers so far. No pain for me too. The pain after every treatment is very bearable. I think my teeth are coping the pressure super well. I went for my treatment today and Dr Wee helped me bond the most back tooth as well. I really hope it can be done by next year before March! Only 5 more instalments to pay. hahaha. Ok, i shall take a picture from photo booth now to show the progress. Purple arrows means the gaps formed due to extractions are closing now. 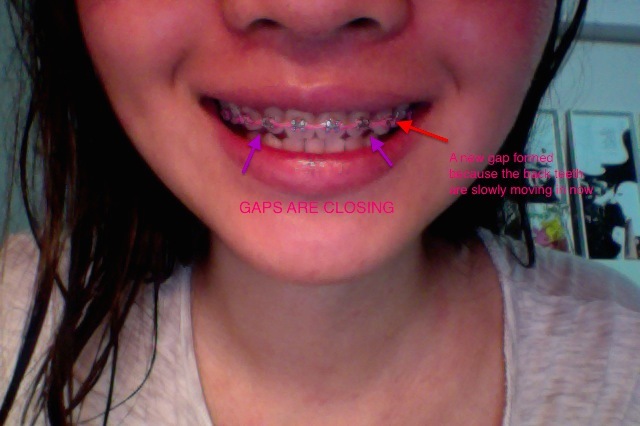 However, new gaps formed (at the red arrow) because the rest of the teeth at the back are slowing moving in ONE BY ONE. My progress at both sides of the teeth are different. My left side is closing better than my right side. Ok i'm happy! BTW i only have upper braces done. Happy to see you're doing well, about 10 months in! Though it's still a long way to go, I'm glad to know that the gaps are gradually closing and the results are evident; however subtle they may seem. I wish you all the best for the remainder of your journey with braces. Cheers! Great to see how well you are doing. My wife and I had our daughter get braces a few months ago. Progress was also slow but so worth it in the end. Our daughter has great looking teeth now and she thanks us everyday for suggesting the braces to her. To many more great smiles god luck on the journey. My teeth were similar to yours when I first got my braces. One of the best things I experienced with the gaps coming closer together was how much less I needed toothpicks! Like you I had a little bit of pain after each session, but it wasn't bad at all, and definitely worth it! Kinohimitsu Detox Tea: No more bloated stomach!